There are a fair number of frogs getting squished on Hwy 30 just south of the Harborton Road exit. I think the cliff and sidewalk should be checked every night that there's a Harborton patrol. Last night we collected 35 frogs on Harborton; half of them (including the only gravid females found) were caught in this area. It's particularly important to check at the beginning of the shift because it seemed as though the frogs we found were queued up and waiting to make a break for it. There'd been a big movement the previous evening, and Rob and I speculated that many of the frogs had been too late to make that crossing and were waiting for the next opportunity. The skin on many of them was quite dry, as if they'd been in the open for some time. We also wondered if they were attempting to skirt around our patrols and coming out further south. I followed the sidewalk until there were no more dead frogs to be seen on the highway, just beyond the second lamp post. I find most of the frogs under the curtain of ivy where it meets the ground, and they're easiest to see if you squat down. We often find frogs huddled up against the sidewalk curb, so it's important to check there, too. Not every team member will feel safe checking this area, although I feel comfortable walking there with the sidewalk and the highway shoulder. When I was young I did a great deal of hitchhiking. A highway patrolman in, I think, Maryland, gave me a ride, mentioning that there was a guy who’d slow and pull over for a hitchhiker, then speed up and run him over. I don’t know if this was true, but since then I’ve never let a car pass me on a road without eyeballing it. When catching frogs in the Burlington area, or the sidewalk Maggie mentions, I pay close attention to the cars, so a drifting, text-messaging sport won’t find me. I walk and bike across this highway frequently, and it’s dangerous, so I’m hyper careful. When frog migrations have fallen on nights I’m responsible for, I’ve focused my effort on the highway sidewalk because that’s where between 15 and 50% of the frogs will be. Again, I’m hyper-attentive, mainly nabbing frogs against the curb, as they huddle there before making a break to cross the highway. I understand why some folks don’t want to be next to the highway, and wouldn’t think of allowing anyone to be there who might be less than vigilant. When these frog migrations were huge and unimpeded by modernity, before colonization, mortality was likely high, as the many predators surely feasted with many thousands crossing the landscape. (Many species use great numbers to confuse and overwhelm predators, but some among them won’t make it.) What has changed is now there are so few frogs, each can seem weighted. Still, frog death is natural to these migrations, and some will occur on our watch. Sentiments that apply pressure toward no frog dying are unrealistic, and I think, take us out of the realm of compassion -- for the frogs, and each other -- because we may be forgetting that we’ll soon be migrating across the horizon as well, as we should. I entered the monastery a decade later, Suzuki-roshi having since died. The three month practice periods, in the fall and winter-spring, were indeed “just sitting,” with light work in the mornings and afternoons. Summer was “guest season,” when paying visitors came to enjoy the hot springs, mountains, creek, and luxurious vegetarian meals. Somehow, after Suzuki-roshi’s death, when his American students took charge, there arose never-ending need: a new bridge to the bath house, more cabins, stone stair cases, yurts on plywood platforms, new bathrooms, fences, a beautiful new kitchen, a new bath house, more stone walls. During the busy time getting ready for the summer guest season I was tasked with painting several of the cabins. I worked with a couple helpers, mindfully painting. This is how our meditation practice bled into work, by concentrating deeply on each little thing. The painting progressed, slowly, carefully. The woman in charge of guest season preparations -- a gifted administrator -- came by after a couple days and said, “This is taking too long! Stop practicing and get these cabins painted!” “Just sitting” had taken a back seat. Before the frog group I’d never been involved in the creation of an organization. I trusted that its needs would be met as we went along, and they were, and then some. It began six years ago with calls to biologists about this phenomenon of waves of frogs hopping into four lanes of rush hour traffic. A simple plan was initiated, helped by bright faced volunteers so eager they seemed to fall out of the sky. Ideas to improve the mechanics and function of our effort abounded. My favorite was the guy with the rocks: we use plastic buckets with a hole cut in the lid to transport the frogs. A frog jumping out through the hole was a rarity, but this new volunteer didn’t like the holes and placed rocks over the opening in each bucket. Many of the rocks barely covered the holes. I pointed out to him they could fall on the frogs inside and took the rocks off the buckets. I left for a short while. When I returned the rocks were back on the lids. Refinements of our effort are endless, come from every direction, and are each -- to their creator -- not only crucial, but may save a frog; which makes them a moral imperative. The complexity of catching frogs grows with the passing weeks, years. We progress toward frog catching flawlessness. This stubborn insistence on imminent perfection is Western Man’s way of throttling the joy that‘s all around us. The lakes, sloughs and marsh that lined the river between here and downtown Portland -- where these terrestrial frogs bred -- have been filled for a hundred years. The road and train tracks that separate the forest from the last remaining wetlands have been here even longer, but the intensity of traffic has grown exponentially in the past two decades, putting the remaining frogs in an impossible situation. Growth races ahead of the perfection we’re sure is just around the corner, also propelling our rather desperate frog effort. Even within our small volunteer group the intensity of this momentum toward perfection is impressive, the inevitable bureaucracy driven. Impeding this push is perilous, dominance imprinted behind our eyes. It reminds me of the mid-nineteenth century white settlement of this region, a colonization that has never ended, crushing whatever gets in its way, Indians first, now frogs. How did we come up with a God in our image who’s perfect? The Multnomah people who lived here before us -- for thousands of years -- emphasized harmony; with the spirit world, the planet, each other. They revered Coyote, a wandering buffoon who was forever getting into trouble. With each conundrum Coyote’s misadventures met, he sought guidance from his turd sisters, who lived in his stomach. Coyote’s little shits always helped him, even though he annoyed them by pretending their wisdom was his own. Their advice created much of the cultural taboo the Multnomah lived by so faithfully, rules they knew preserved harmony, even if the many taboo were laborious, and from the mouths of little shits. When the white settlers came, these wise people were baffled: why did the new comers pay so little attention to what their perfect God taught? Why were these white people so driven, in such a hurry? Meditation is difficult, and so is living in harmony with the planet. Rather than plunging into the difficulty, with the possibility we might rub up against wisdom, we distract ourselves with never ending building projects, shiny gadgets, our little rocket ships. Frog humility has given them success for hundreds of millions of years, patient within their meek place in the food chain. In contrast, human evolution threatens to peak, after a very short run, with Donald Trump. We liberals, basking in purity and righteousness, like novice monastics, bridle at such a thought, sure we are nothing like the Cheeto Mussolini. To prove this ignominious fate wrong, and to help frogs in the long run, perhaps we need be more like our small, fellow citizens. The landslide was muffled, almost genteel, three tons of mud rock and clay settling quietly onto the roadside just north of the waterfall. Our Saturday night crew was gathering near the little parking area, above where Harborton meets the highway. We all looked, startled that it was indeed a slide, but with no drama, no crash boom; more like the ridge sloughing off a few skin cells. Recognizing the portentousness of the event, we all went up to examine the new pile, Richard immediately pushing on a boulder the size of a ottoman that had rolled into the road. I helped him, our contrasting rolling, sliding styles surprising me that we managed to move the heavy rock. Gratuitous jokes ensued about frogs starting slides, escaping slides, under slides. It was getting dark, was almost 50 degrees, and misty; this was looking like the night they’d been waiting for this icy winter. With dark it began, Maggie Rudy picking frogs from the ditch, the grassy bank, the road; Kat Balogh about to lose her squeamishness about frogs forever; Richard Alden patrolling higher up the road; me going down to the highway where there were already several squashed frogs on the pavement; frogs making a break for it even before dark. I walked a couple hundred yards down the highway, scanning the cement sidewalk with the head lamp and looking over my shoulder to keep track of 60 mph traffic coming up behind me, four to six feet away, picking up a couple sandy colored males crouching motionless on the gravel littered cement. The cliff next to the highway is 30 feet high and covered with shrubby ivy. Walking back, facing the traffic, I concentrated on the gutter where frogs huddle against the curb, cars and trucks roaring by in their clouds of spray. A male two yards in front of me made a break across the highway, got about fifteen feet and froze as a car howled over him. Each vehicle takes a slightly different course in their lane, the next car agonizingly close, and the next so close the wind flipped the frog over. No cars coming I slipped out onto the pavement, grabbed him and dashed back. Back and forth, back and forth I walked the highway, always watching for cars (“sharks,” a friend who rode a motorcycle called them). The rest of the crew took care of shuttling the frogs to the wetland and counting them, a big help to me. Now it was raining and gravid females waited patiently by the curb for their chance to cross, obviously enjoying the little stream that now ran along the gutter. They’re not stupid; they stop in the middle of lanes, in the middle of the highway, trying to finesse it, but they’re so over matched by the speed and violence, especially from the semis and all those tires, that until traffic abates for the night they face very long odds. I was facing the oncoming headlights of the two near lanes when a few feet in front of me a big female I hadn’t seen bolted, hopping quickly, probably trying to escape me, making it a few feet into the first lane where a car clipped her, crushing the feet on her right side. She sat there for a couple seconds before a truck obliterated her. My bucket was heavy with frogs and I headed toward the other froggers, feeling sickened, hollowed out by what I’d just seen, then bucking up by reminding myself of the heavy bucket, the bigger picture, to not sentimentalize. Maggie and Richard were running the frogs to the wetland, and I turned my bucket over to them, wandered around, checking in to make sure everyone was okay. Regulars Pat Yoder and Katy Clifford had arrived, with niece Christy Yoder, and friend Andrew Jenkins, in tow respectively, so I met them, happy it was a big night and they’d have a good time. Then back to the highway where the gutter yielded one big female after another. Four inches long, some a little longer, their flanks the most beautiful brownish red, swollen with from 500 to over a 1000 eggs. After climbing down the cliff the frogs emerge from the ivy, cross five feet of dirt and sidewalk, and drop over the curb into the gutter, ready to sprint out into the waves of cars and semis, a steady stream northbound till 7PM, in sporadic gangs in the near lanes, the chaos deafening. Along the two hundred yards when the migration was most intense the frogs were appearing all the time. Fortunately they usually squeezed up against the curb, frightened, and I walked along, freezing them with the headlamp, reaching down, palm on their back, fingers folding over their snouts and under, then slipping my arm through the hole in the top of the bucket, laying them on the bottom with their compatriots. Kat was afraid of the traffic but after seeing a frog hopping for its life dismembered, had to help. I told her about watching the cars and she helped me walk the highway. This went on for four hours, the temperature slowly dropping till at 9:30 it was 44 and the migration was stopping. While mingling with the crew, asking them about their night and their impression of whether the frogs were stopping yet, Maggie gestured, saying, “Look at this,” shining her lamp at the licorice ferns draping the cliffs that flanked the waterfall; one could see the light reflecting off little pairs of eyes, waiting. My knees were killing me, we were all happily exhausted. I went with Christy and Pat to release the final group, as they hadn’t seen where we release them. It’s very satisfying watching the frogs hopping over the grass into the darkness toward the wetland, that they are safe for the moment. It’s important for all the volunteers to have this experience. One by one the four parked cars left, Katy pausing, her headlights on the guardrail. I thought there might be some problem and walked over. One last male was against the curb; Katy put it in her bag and brought it to the wetland on her way home. We knew with such a cold winter and little opportunity for the frogs to move, once they got a chance the ground would be hoppingly alive. The night had certainly been intense, but I really had no idea: we’d caught 520 Northern red-legged frogs. The unusually frigid winter continues in the Northwest and the frogs are showing signs that even their endless patience has its limits. From the end of November through January the temperature’s been hovering around freezing, diving well below at night. An exclamation point was added the night of January 10 when -- in a place where a 6 inch show fall is unusual -- 16 inches fell in a few hours. (The show was accompanied by lightning for good measure!) Since the tiny migrational pulse of November 14, we didn’t see a single frog till January 21, when, apparently in solidarity with the Woman’s March, they made a fair showing, most of their signs yelling about the coming evisceration of the EPA, though the frog’s activism was of the strong, silent variety.) On the 21st it was 40 degrees at dusk, in our experience too cold for movement, and I headed for the local watering hole for dinner and beer, not necessarily in that order, running into friends intent on political rabble rousing. Unbeknownst to me the temp had risen to 45 (the threshold for movement) by 7pm, the air just misty enough to invite the little guys out. Jane and her husband Mark, seeing the temperature in their car, checked Harborton on their way home from dinner, encountered a gaggle of frogs and the call went out for help. The feathers were flying at the bar, and my phone has a sneaky habit of turning the ring tone off, so when the phones vibrations on my leg finally pierced the partisan cacophony I’d racked up four messages. I dashed out leaving a full beer on the table. The mile and a half to Harborton was quick, I leaned the bike against the guardrail, got the box with the headlamps and assorted frog equipment from my house, and joined the dedicated souls who’d answered the frantic calls. It was almost immediately pleasant to be out there catching frogs again with the frog folks; it had been awhile. We caught 88 males and 17 females over that three hours as the temperature dropped below what we thought was the low threshold of 43 degrees. By 10pm the temp had dropped to 39 and even then a little male ventured out onto the road. The frogs were leaving the relative warmth of deep duff up in the forest, braving the cold, dry conditions, and the threat of sudden murder, in the hope of lounging in the icy water of the wetland to spoon frog-style and generate legends of earnest pollywogs. Since January 21 the cold has resumed and the frogs wait. On two subsequent nights that were both dry and in the low 40s Shawn found a handful hopping out into the roadway anyway, their determination palpable. Cold winters aren’t unheard of in this vicinity; the Willamette River froze over in 1979, the Columbia itself froze solid in 1930 (and so much colder then the present), and of course the frogs lived here through the ice ages that ended some 10,000 years ago, so for such resilient creatures a single cold winter is simply a time to hunker down and wait for the warm, wet night that will surely come. The larger problem for them is the Anthropocene, and its relentless pressure for endless growth; winning, so much winning as to be tired of always winning.. The forest where the frogs live, and the Willamette River's confluence with the Columbia, an industrial area on the right, Sauvie Island on the left, and Washington State in the distance. New Years Day and slushy snow fell over night. It’s in the high 30s and the birds are entertaining me, chowing down on seed I’ve spread about outside on a table and the ground. Flocks of juncos, golden crowned sparrows, and mourning doves; a gang of Stellar jays, a pair of scrub jays, song and fox sparrows, spotted towhees; lots of wild, precise, dashing about, furious pecking, endless supplanting (they’ve eyes in the backs of their heads! ), doves charging thuggishly about on their stubby little legs like robot vacuum cleaners, the jays eyeing them nervously. Watching all the action, the amusing chaotic order, each species with a strategy to get enough to eat -- and they do! -- myriad layers of aggression but no one ever gets hurt; the circus has come to town and joy rises in me like a fountain. The chipmunk arrives at the table, a wildcard, stuffing his cheeks. One arriving bird after another glances at him uneasily and leaves; an egg thief for sure but would he attack? I don’t know and birds don’t chance it; amazing how clear to see, the apprehension in their faces. It now looks like the super moon (full and close to earth) November 14 likely instigated the small migration we had that night. During the remainder of the month there were 12 wet/rainy days with evening temps above 45 degrees but no further movement, though the 14th, at 54 degrees F, was by far the warmest. December has been colder and drier than November, with the dusk migration threshold of 45 degrees reached only 4 days, 47 another 2, but no frog movement. An interesting exception occurred a week ago when Jane, awake at 4 am, decided to check Harborton and found frogs on the road. She caught 8 over the next couple hours. Of course traffic is very light at that hour, and so is a good time for migration, though hoping the frogs might change their schedule from dusk to very early morning is way too much to ask. This week is supposed to be the coldest yet, so the frogs are probably snug up in the forest, buried in the duff under a fern, and we can expect a really BIG night when it’s pouring rain and the temperature approaches 50. Western sword ferns, mid-December, in the Newton Creek watershed, where the frogs live. The opening migration of our fourth frog season continued a pattern: it was three weeks earlier than the previous year. In 2016-17, the first movement was November 14; 2015-16 began December 7; 2014-15 - December 20; 2013-14 - January 7. This may be a simple coincidence, as the Northern red-legged frog’s forest to breeding waters migration window is from October through January, or perhaps the record rainfall we had this year in October may have primed the pump, or the small migrational pulse we had November 14 (17 frogs caught) may have been the local crowd who live toward the forest edge, or perhaps the Super Moon of that very night, the 14th, played a role. (Some believe a full moon influences the frogs.) The “local crowd” possibility may be supported by the fact that the 17 frogs were 9 males and 8 females (proximity to the wetland encouraged the females to move? ), whereas usually the males far outnumber the females in the early migration, as they establish breeding territories in the wetland in preparation of the females arrival. Some have suggested we’ve simply missed earlier migrations in previous years, though this is unlikely as I walk up Harborton Drive (the first obstacle the frogs cross) nearly every day and would see signs of migration (dead frogs), or smell them (squashed frogs have a strong fishy smell). At any rate this is the sort of inside baseball stuff one thinks about when frogs have burrowed into the overgrown underbrush of one’s brain, and also, much to our chagrin, the migration season, and our evenings standing in the rain, gets three weeks longer each year. Since the 17 frog night it’s been two weeks of tempting temps (44 to 48; borderline teasers) and rain, so we have to be ready every night for a major migration, while the frogs apparently are hanging out, cozy under ferns, or assembling on the edge of the forest to make a break into increasingly heavy rush hour traffic when we least expect it; who knows? Jane Hartline has knocked herself out once again putting together the nightly volunteer teams for each evening of the week. We have seven team leaders, each now with an assisting leader, who monitor their night’s weather and let their six or eight team members know if frog conditions look iffy, nonexistent, or perfect, meaning the team ought to stay home by the fire, be prepared to be summoned by a frantic phone call, or be out in force at dark for sure, as things will be hopping! There’s always a certain amount of guess work, as the frogs have repeatedly fooled us; not showing up when conditions seem perfect, or appearing while it’s still light out, or three weeks earlier than expected. Over the summer we’ve also been making arrangements to build small ponds on promising spots in people’s yards on the west side of the highway, to begin seeing if we can create appropriate breeding habitat so the frogs and salamanders don’t have to brave the highway. Dawn (from right to left): forest, Mt Hood, Willamette River, frog wetland (below frame). Last Saturday, March 26, 2016, Maggie Rudy and I patrolled Marina Way, just above the wetland in which our local red-legged frogs breed. We’ve been thinking the migration was over, but there were good frog conditions that night: 52 degrees with light rain turning to mist and back again to rain. Once again Maggie proved herself the consummate frog catcher, and in the process caught the thousandth frog headed back to the forest from the wetland. When Maggie saw this photo taken with frog “M,” which I thought charming and amusing, her comment was, “Ha ha ... it looks like I’m about to pop it into my cauldron!” So there you have it; I wondered how it was that Maggie caught 19 frogs and I caught 1, and even that frog Maggie, out of pity, pointed out to me. All evening Maggie suddenly materialized next to me and caught invisible frogs. I think you can see what’s going on here. In the last post I mentioned the imbalance in numbers this year: 688 frogs assisted downhill and 1016 going up, almost all the over 300 frog difference being males. (This compares to 580 down and 572 up for the 2013/14 season and 695 down and 750 up for the 2014/15 season, the number of males and females nearly balanced.) The mystery of this odd change has been solved! There have long been reports of frogs falling from the sky, this odd phenomenon attributed to cyclonic winds -- little tornados -- lifting frogs out of their wetland home and dropping them some distance away on a quaint village. Careful study by our scientific team has turned up an amazing insight into the lives of male Northern red-legged frogs that both explains raining frogs and how all these male frogs got to the wetland without our seeing and catching them! They can fly! Yes, amazing as it may seem, just below the dorsolateral fold, on either side of the male frog’s back, is a flap of loose skin the frog holds with it’s hands and feet, and quite like a flying squirrel, the frog can glide for quite some distance, like tiny caped crusaders. Rocket J. Squirrel, meet Jed I. Frog! According to these new observations by Dr. Norm Landia, of the Department of Fish and Wildlife, late at night the male frogs climb trees in the forest and glide all the way down to the wetland, avoiding our “assistance,” and demonstrating this astonishing evolutionary development. A squadron of male red-legged frogs gathering in preparation for take off. The basic pattern of the Northern red-legged frog migration is straight forward -- the males go to the wetland first to establish a territory, the females arrive a bit later, generate an egg mass, then return to the forest, with the males continuing to woo more partners before returning themselves -- but how the migration unfolds over the course of the winter is anything but simple. A huge gap in our understanding is we know little about the forest lives of these frogs. Not knowing much about their day to day existence, we don’t know if they slowly ease into migration, going short distances each day, or hop pell mell toward the pond. We don’t know from how far away they come (though we suspect it can be a trip of several miles), or when they begin. Weather is currently our main complexity in predicting when the frogs move, especially since the migration takes place after dark, with the temperature often dropping below 45 degrees, the “stay or go” temperature threshold of the frogs. Winter evenings in the Northwest are often wet, a condition the frogs require to venture out from the security of wet woods, but, especially with climate change, long dry stretches, sometimes several weeks, are now usual. Sometimes all the conditions seem favorable, and still the frogs stay pat up the hill under a fern, or down in the cold water of the pond. More questions, “Seven gravid females went down. Are they just late to the party or did they travel further? Or is this just genetic diversity at it’s best … allowing a range of behaviors so that all the eggs aren’t in one basket.” From February 4 to the 29th there were twelve days when frogs moved: just 1 frog on the 4th, 222 on the 26th, the average haul for those twelve days just over 60 a night, with overall totals looking like they’d be similar to the two previous years; numbers to the wetland and then back to the forest nearly the same. February 26 blew the numbers, and our assumptions, out of the water -- 191 males headed up from the wetland; we’d assisted 686 going down and 890 going up, with a couple hundred more males than females. How did all these “extra” males get to the wetland? Where did they come from? Another development in February was an emphasis on catching lots more chorus frogs than we used to, bringing them down from Harborton to sing their hearts out, or squeeze an egg mass onto a blade of grass amid their enveloping cacophony. (It’s amazing to stand in the singing’s midst, with all the layering and pulse.) So small and so numerous we’d been ignoring them in past years; it felt good to that we were taking them in, dealing with their escape artist climbing, and then watching them boinging toward the pond, more lives saved. (Pacific treefrogs remain numerous, their life habits apparently less in conflict with the cluelessness of their upright neighbors than their larger brethren, the red-leggeds.) Smaller than a fifty cent piece, they offer no resistance to being caught (though they squirm in hand). Does their size make flight or fight useless strategies? Their perpetuation as a species relying on numbers and being easy to overlook because they’re so small? March arrived the same wet lion as the previous months of this rainy winter, with 100 frogs -- nearly all males -- returning to the forest on three nights by mid-month: it looked like we were done for the winter, frog catchers frayed around the edges and the frogs as patient and nonplused as ever. (“Just put me down and go away, pal.”) Of course, another 100 males going up makes the numbers and sexes returning to the forest even more unbalanced. And brought us close to the 1000 frog mark, so at our frog volunteer dinner on March 13, it was decided the thousandth frog should be named “M.” We’d photograph our frog of the hour dressed like a gentleman, sitting at the wheel of an Austin Martin, juggling a martini and a Beretta in one hand, the other firmly anchored under the arm of a gravid female. By the way, the dinner was a great time, after we got used to seeing each other not in a monsoon suit, and in the light (quite a shock for some of the more sensitive folk, I screamed once myself). We could face one another and not blind anyone with our headlamp, and enjoy each other’s company without worrying a frog was slipping by us to get squashed on the highway. I’m one of those “wouldn’t want to belong to a club that would have me” people, but I must admit, frog catchers are a hell of an entertaining bunch, even without the crowns, green velvet suits and frog scepters. One of the things I like best about the frogs is they make a fool of me on a regular basis. (If there’s one thing we honkies need more than anything, it’s a little humility.) The very first red-legged frog of the 2014-15 season, when I reached down to grab him, jumped straight between my legs. By the time I’d turned around he’d vanished into the leaves beside the road. (A fun metaphor from frogger David Craig in a blog for Portlandorbit (link): “Catching frogs wasn’t too hard. I figured out how to scoop them up and quickly became a kind of biologist short stop.”) I’d not thought of “fielding” frogs, but have had them jump into my cupped hands, reached out and caught them in midair, juggled them and caught them on the way down. One was riding a little stream along the curb on Harborton, so I reached down with cupped hands to field him, he stopped suddenly and leapt mightily over my hands, and disappeared, plunging neatly through the grating of a rain water drain. I could only hope he’d survive the wild ride through hundreds of feet of culvert that end on the far side of the highway with a ten foot drop onto big rocks. Sometimes neighbors stop in their cars to chat and see how the frog catching is going. “Show me a frog!” Jennette exclaimed through her open window. I got a placid frog out of a bucket and went over to the car. The relaxed frog suddenly tensed and leapt into the car. Oh, NO! The places it could go! The elderly couple sitting there as spry as guardrails! The frog jumped in Jennette’s lap, she caught him and handed him over; disaster averted. A couple weeks ago I was riding down to the wild singing in the wetland with Maggie Rudy and a bucket full of treefrogs ready to join the chorus. A short way down the road a large frog was in the middle of our lane, waiting patiently for the bright light that’d suddenly found her to go away so she could continue her dark journey back to the forest. I jumped out of the car and caught her, a female we’d give a ride to the forest later. I sat in the passenger seat holding the relaxed frog. We only had a few hundred yards to go. My attention wandered from the frog in my hands (you’d think I’d learned my lesson by now), and the strong critter disappeared between the seat and the door beside me. Ahhhh! (I can hear Click and Clack laughing as they explain how to remove a dead frog from a vent.) We parked and looked everywhere for the frog, discovering that the bucket in back had fallen over and the chorus frogs were loose too! The tiny frogs appeared here and there for the next fifteen minutes but we never found the red-legged, Maggie gracious as always, through slightly gritted teeth. Michelle Delepine "caught" this chorus frog in action, complete with the racing stripe we've been seeing lately. Thanks to Sheilah Toomey for pointing out the Mt Hood “eruption” is in fact the projected shadow of the mountain. Here’s another example, this one taken February 10, at 7:15 AM, whereas the 2/3 image was taken at 7:25. While only two of the nine nights represented here saw migrating frogs, one can’t help but be struck by how much the local temperature hovers at or around the 45 degree F threshold which largely determines -- along with moisture -- whether the frogs move or not. On January 28 at dusk it was 45, the 29th 45 at dusk and 2 hours later 43, the 30th; 43/36, 31st; 41, February 1st; 43/41, 2nd; 45/43, 3rd; 46/43. These tantalizing wet temps keep us vigilant when we’d rather be warm and dry at home, raising the question of why does temperature and moisture matter to the frogs? Northern red-leggeds lead very secretive, quiet lives in the forest, always in moist surroundings, as they must keep their skins wet to stay alive, so when they’re not around streams they find moist places under logs, duff, in burrows, under ferns, and so on, to both stay wet but also to regulate their body temperature. As the air gets colder they’ll find ways to go deeper into the ground (burrows, crevices, or simply wiggling down through leaves and duff; one female who was evading me disappeared down into the wet leaves in seconds as if she were doing the Twist). During migration they’re foregoing the protection of their reclusive forest homes. 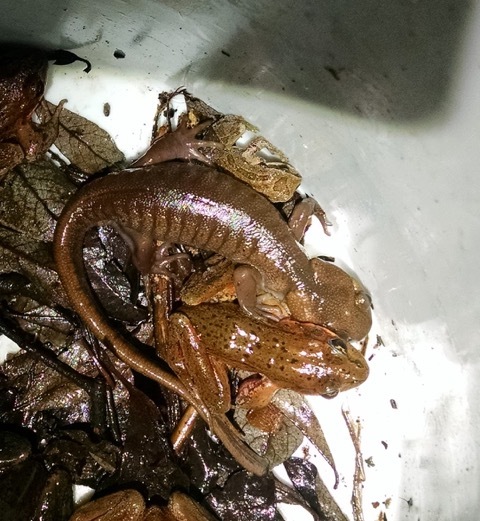 Darkness, warm and wet, is their only support as they venture out of the forest to breed (that is, till they get to the pond). January 27 and 28 saw a pattern that recurs; a movement of frogs the first night the conditions were right (on the 27th it was 50 degrees and misty, 17 frogs caught), followed by a much larger movement the next night (on the 28th 145 frogs were caught, the temperature between 52 and 49). Interestingly, this second night began with dry pavement (which they rarely venture onto), the frogs hopping forth anyway, perhaps because they were impatient after long spells of unfavorable conditions, or, since so many headed back up to the forest over dry pavement -- 136 -- they may have some confidence they’ll be okay once back in the wet underbrush. As the night deepened light rain fell and more frogs came out, Sue’s crew staying out till 1 AM. Our totals for the season so far are 614 frogs assisted down to the wetland, 199 assisted up to the forest. We may have seen the last frog coming down, but this isn’t clear yet. On another note, this is a photo taken toward the east north east with Mt Adams (a 12,281 foot stratovolcano) behind Cascade ridges, industry along the Willamette, and in the foreground, the Alder Creek Superfund mitigation site on the southern tip of Sauvie Island, right across from the PGE Harborton wetland. I’m pointing this area out, the tip of the Alder Creek site, because the lagoon was carved out of the island for salmon fry to rest in on their way to the ocean. PGE Harborton is also a Superfund mitigation site (that is, interests who have incurred a “debit” to the environment -- they have polluted or otherwise damaged land -- can buy “credits” on environmentally constructive projects to offset their debit). PGE’s plans for the site appear to remove the existing wetland in favor of a stream, as they are designing with salmon and mink in mind, leaving the frogs out of the equation. (A simple solution would be to encourage beaver to dam the stream, which would benefit both the salmon and the frogs, but it’s not clear PGE would entertain this option.) We’ll keep you posted! Some may wonder why Portland’s iconic mountain, Hood, hasn’t appeared yet. The Harborton neighborhood is in a concavity on the ridge line, so trees hide Hood except from certain angles. This picture, facing east south east, was taken yesterday morning. It’s interesting how a large mountain interacts with the sky, cloud looking like an eruption. (If anyone knows what's at play here, we'd love your input.) The towers lower left are at the river edge, leap across the water and march up over the ridge in a cut through Forest Park, which we’ll come back to later when we begin to get into new pond possibilities. The eagle we noted earlier roosts on the tallest tower in the park each night with its mate. As you may be gathering by now, this frog business isn’t all merrily dancing about the hurtling traffic nabbing hopsters. While we have a good idea in what conditions they migrate, the frogs do what they want and when. We spend hours scanning empty pavement waiting for their appearance, waiting on predicted weather changes that may or may not come. Of course under their stoic, inscrutable facade, frogs may have a wicked sense of humor. They may be sitting under the licorice ferns on the slope above Harborton Drive watching the lights wander empty pavement below, the beams searching here, then gliding up the road, probing the curb under the guardrail, then crossing the road before losing focus for a moment and distractedly scanning the hillside, light meandering over arching blackberry canes, tufts of dead grass, the ferns hiding the frogs, who are having a rollicking good time watching the stupid human trick down below, then flipping a coin to see who will go down to the edge of the road, catch a light’s attention, then disappear into the ditch with one jump, to rejoin his friends watching the team of bright eyed cyclopes scouring the area for that damn frog that was right there a second ago. And the frogs up on the hill laugh, and laugh. Why do we enjoy imagining frogs emulating us at silly fun -- minstrels at the fair, bar room card games, working a hillbilly still? Perhaps because their extreme patience, their forbearance, makes us uncomfortable. When Euro-Americans settled this area in the 1850s, they couldn't "tame" the landscape fast enough. Wilderness was thought ungodly -- a large departure from the Multnomah people's belief that each and every plant, animal, stone, stream had a spirit. For all of our technology and big brains, we are the only animal out of step with the planet, and the frog, and life generally, pays. Our catching the frogs is really about learning from them, and hopefully getting the message before we destroy them, and ourselves. The confluence of the Willamette and Columbia Rivers, once a huge wetland, which, during the Missoula floods was a giant whirlpool. It was a quiet six days, with 0 to 4 frogs caught on five of the nights, but on the sixth, the 21st, the frogs had their way with us. When the crew leader checked before dark it was dry on Harborton. It started raining later, but not where the leader lived a few miles away, the locality of showers escaping him. With the temperature above 50, once it started raining the frogs took note. Shawn stopped by Harborton to say hello on her way home, and encountered frogs on the road and no one there to catch them. A chaos of phone calls ensued, and later recriminations, hurt feelings, fury, an impressive ladder of e-mail climbing from the ruins of our frog catching system, through collective failure just short of murder, more hurt feelings, apologies, resignations, pleadings, and on up to maybe it wasn’t really so bad. Maybe this frog thing is going pretty well. So we pick ourselves up, dust ourselves off, and what else, have a meeting. That we make carrying frogs across the road so complicated is perhaps an indication of why we have to carry the frogs across the road. Sunday the 17th the pavement was wet at dusk, the evening showery, temperatures borderline. Sue helped Anne's crew of five, catching nine frogs early and 13 a bit later as it became wetter. A total of 13 males and 9 females getting a ride down to the wetland. Sue releases frogs at a little gap in the blackberry canes that line the berm tracing the north side of the pond, about 200 feet toward the river from Marina Way. From that vantage point she's been hearing a great horned owl hooting from the trees along the river. Last year a barred owl was calling from the same area. Might the eagle owl have evicted or killed the barred? That same spot, away from the traffic noise, is also where we go to be immersed in the winter chorus frog symphony. The treefrog leaders are warming up now, and a few nights hence all the males will join in, and the cloud ceilinged hall will be ablaze with song. Light rain and and a warm night (49) made for a long, productive night for Jane's crew of on the 18th. The last release of frogs was at 11:00 PM. 58 frogs were caught going down to the pond, with 3 females headed back to the forest, the first of this year's migration to return to their ferny home. I happened by on my bike, coming from dinner at a local watering hole, and just in time to have birthday cake in the rain at the back of Jane's car. Happy Birthday to frogger Nancy Jane Cushing! January 19th the temps slipped to borderline 45 in a light rain, with 21 frogs caught, 15 males and 6 females over the course of 5 hours. One female was headed back to the forest. The 20th was drier, with similar temps (45/43), light rain, with 2 frogs caught headed to the wetland and 2 escorted back to the forest in 3 hours of walking the pavement. January 12, 2016 - Heavy rain and a warming trend forecasted for the week has the frog cab company on its toes again. There are at least 113 females down in the pond, since we ferried them down from Harborton December 7 and 8, plus those who made it on their own. Since the females don’t hang around long in the pond after their eggs are deposited, and they’ve been down there five weeks now, we’re expecting frogs to go both down from the forest and up. 43 degrees F at sunset, and a little cool for migration, only one male was caught on Harborton, and one female on Marina Way, both frogs caught 1 1/2 to 2 hours after sunset, so they were perhaps a little tentative, not moving as soon as it was dark. (Big migrations usually explode at dark, the frogs jumping at their chance.) Panos was crew leader, doing a great job of hanging in there till he could be sure of what the frog’s were doing. I happened to be going home, walking up Harborton at 7:45, shortly after Panos left, and didn’t see any frogs. Tomorrow night is supposed to be warmer, so we’re getting excited, though the frogs probably take the weather as it comes, calmly. January 13, 2016 - A misty night with the temperature hovering around the usual cut off for frog movement -- 45 degrees F. After this long frog lull we expect the frogs to be impatient and ready to migrate if the conditions are remotely favorable, but they apparently bide their time. Sue’s crew caught 20 early in the evening, mostly along St Helens Road, coming down the cliffs. January 14, 2016 - 43 and light rain at dusk, Jeff’s crew hangs in along the dark roads for a couple hours, catching one frog not long before they leave. January 15, 2016 - Temp lingering at 45 with very light rain, no frogs, the weather continuing to tease us. January 16, 2016 - Expecting the females who came down in early December to head back to the forest soon, since they have no reason to stay in the pond after depositing their eggs, we install a hundred feet of the new fabric fencing on Marina Way during the afternoon to make catching the hopsters easier. Rain all day, sometimes heavy, stops late in the warm afternoon. By 5 PM, when my new crew assembles on Harborton Drive (this is the first Saturday -- our night to frog -- my team has come out since Jane put these teams and schedule together early in December, so it’s the first time we’re meeting each other). The temp is 50 but the clear sky shines off the wet, black pavement. The forecast is for a rainy night so we anticipate a big night; Sue came out and is down at Marina Way. In the next 3 1/2 hours we catch 27 males, 4 females and a treefrog, all on Harborton, and all up the road past the falls and down where the road curves to meet the St Helens Road. We don’t see any along the highway, where they were being caught on the 13th. Perhaps we should make an effort to see if there are egg masses down in the pond; might the frogs wait out the cold weather to deposit eggs, as freezing cold will destroythe eggs? My new crew is great; eager, knowledgable, dedicated, fun. Katie Clifford and Linda Zahl caught a quite a few up past the falls. Dry and cold the past week; no frogs. Today is a Northwestern anomaly; a beautiful, clear winter day, a picturesque time to mention and show an incongruous challenge our little frog pond faces. I gimped my way down to the highway, having tweaked my back yesterday at an ivy pulling event (I’d like to say I was pulling something serious out of the ground when I hurt it, but the truth is I was doing some light raking, turned a bit and wham! I think my belt was a notch too tight; the indignity of getting old!) Traffic was light down at the highway, so I crossed like a stooped salamander, carefully got down the bank, made for a log car with a good ladder (the siding full of a log train) and climbed over. Then down to the Multnomah Channel and this sign. Over 75% of Oregon’s petroleum products are pumped down from Anacortes, Washington in this pipeline (actually four pipes), which goes under the Columbia, across the tip of Sauvie Island, under Multnomah Channel and under the frog pond, where it makes a hard left along the railroad tracks toward Linnton and all the tank farms. This photo is taken from the St Johns bridge and shows the beginning of the tank farms, the village of Linnton, mostly hidden in the hillside forest. The pond is located on the right edge of the picture. This next photo was taken from behind the big sign, facing south, the pond in the distance, the first rise of the Tualatin Ridge (and Forest Park, home to these frogs) behind. The Harborton neighborhood is a hundred yards past the right edge of the photo. The photo below is of the tip of Sauvie Island, Multnomah Channel in the foreground (it forms the west side of the island), the blue building the Evraz Steel Mill across the Willamette River, Mt. St. Helens in the background, and one of a pair of Bald eagles who roost up in the park each night sitting in the tree. The photo below faces north (as does the photo above), and shows the pond from one of the two frog release places. The pond has been mostly frozen this past week but yesterday the temperature reached 45 and only got to 33 last night, so the pond thawed by midmorning. The pipeline was built in the 1960s, almost thirty years before we realized the Northwest coast is subject to massive subduction earthquakes, of a magnitude of 8.5 to 9.5 and lasting two to five minutes. The last such quake was in 1700, and they occur every 300 years or so. Neither designed nor built with any earthquake in mind, the question is not if the pipeline will break in such an event, but where, and in how many places. Temps dropped into the 20's and very windy for the New Year and second day of the year, so obviously no frogs. Woke up to a steady snowfall on the 3rd, with temps in the mid 20's. Cold for this area, though not unusual. I cherish the snow, as some winters we don’t get any at all, and make a point of going up into the white wonderland forest. Usually everything is wet when the snow starts, the temp dropping, rain crystalizing, so the snow sticks to ever twig, the forest etched white on black. But after the cold, strong wind for two days, the trees are dry and the snow rests upon, rather than fastening, subtle instead of spectacular. The frog pond (just above the fence) as seen through my neighbor's Bob and Andrew's garden. Well below freezing when this picture was taken, how do the frogs cope? Down in the pond the surface has frozen but the water beneath is warmer, so the frogs there are probably hanging out. (Frogs commonly hibernate deep under water, their bodies remaining above freezing.) Those up in the forest? Probably relaxing in underground enclaves. If the temperature around them drops below freezing and stays there? Good question. Wood frogs in Alaska (Rana sylvatica), which live as far north as the Arctic circle, spend seven months of the year frozen. Slightly smaller than the red-legged, they hibernate in divots of leaf litter near a pond, lake or stream. At first they freeze at night and thaw during the day but after a week or two of this they stay frozen! (The freezing and thawing may help them convert glycogen stored in their livers to glucose. High concentrations of glucose are pumped into their cells, replacing water, and act as a sort of antifreeze, or cryoprotectant, protecting the cells from freezing and desiccation. The water in the cells is pumped into body cavities, where it freezes.) The frog’s breathing and heart stop until it thaws in spring, when they immediately go looking to mate (of course), the males making loud calls that sound like ducks quacking. It’s not known if red-legged frogs are capable of this deep freeze. A clearing trend after morning fog saw clouds slowly disperse until the pale blue winter sky ushered in temps in the high 20's at night, strong winds making it feel colder. Do the frogs sleep under a fern through all this, waiting for a warm night? A pair of red-tail hawks live somewhere along the ridge just to the south. I see them all the time, soaring, hunting on wing and from perches high in Doug firs, often above the pond down below. I read Pacific treefrogs can be a principle menu item for them! Never occurred to me these large raptors would go after tiny frogs. With temps dipping toward the mid-thirties, shortly after noon it started to snow. Thinking it might stick up higher I walked up into the forest. Above about 400 feet the snow fell steadily and the drape of sword fern on the slopes was transforming, black to white, the bare tops of maple disappearing into the pale, falling sky. Up on the Wildwood Trail the delicate twigs of red huckleberry holding a fine lacework aloft, the cedars and frogs patient under the new blanket.